Sentinel Dual is the best solution for powering mission critical applications and electro-medical devices requiring maximum power reliability. Flexibility of installation and use (digital display, user-replaceable battery set), as well as the many communication options available, makes the Sentinel Dual suitable for many different applications from IT to security. Up to 3 Sentinel Duals can be operated in parallel in either capacity or N+1 redundant configuration offering increased reliability for critical system. The Sentinel Dual can be installed as Tower (floor standing) or Rack, ideal for network and server rack applications. The Sentinel Dual range is available in 5-6- 8-10 kVA/kW models with on-line double conversion technology (VFI): the load is powered continuously by the inverter which supplies a sinusoidal voltage, filtered and stabilised in terms of voltage, form and frequency. In addition, the input and output filters significantly increase the load’s immunity to mains disturbances and lightning strikes. 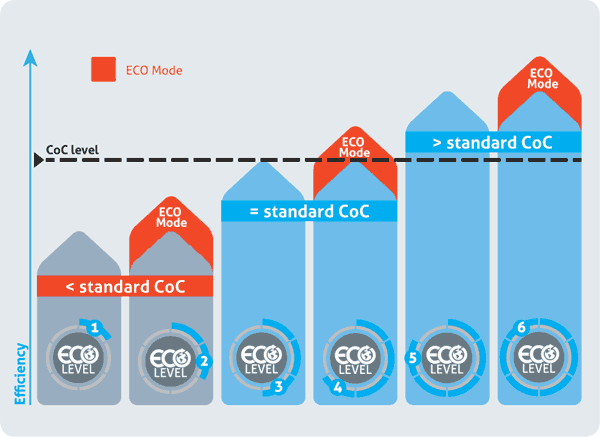 Technology and performance: selectable Eco Mode and Smart Active Mode functions. Diagnostics: Standard digital display, RS232 and USB interfaces with PowerShield3 software downloadable, communications slot for connectivity accessories. Low noise (48 dBA): can be installed in any environment thanks to its high frequency switching inverter and PWM load-dependent digitally controlled fan. Built-in IEC output sockets with thermal protection. Filtered, stabilised and reliable voltage (double conversion on-line technology (VFI compliant with EN62040-3), with filters for the suppression of atmospheric disturbances. Power factor correction: UPS input power factor close to 1 and sinusoidal current uptake. This configuration ensures the operation of those emergency systems that require continuous, reliable and long-lasting power supply in the event of a mains power failure, such as emergency lighting, fire detection/ extinguishing systems and alarms. When the mains power supply fails, the inverter begins powering the loads with a progressive startup (Soft Start) in order to prevent overload. The wide input voltage range and a high holdup time minimise battery usage and increase efficiency and battery life; for smaller power breaks, energy is drawn from a group of appropriately-sized capacitors. 10 A configurable IEC output sockets allow for runtime optimisation by programming the switching off of low priority loads on mains failure; alternatively, emergency loads that are normally not powered when mains is present can be activated. Slot for installation of communications boards.